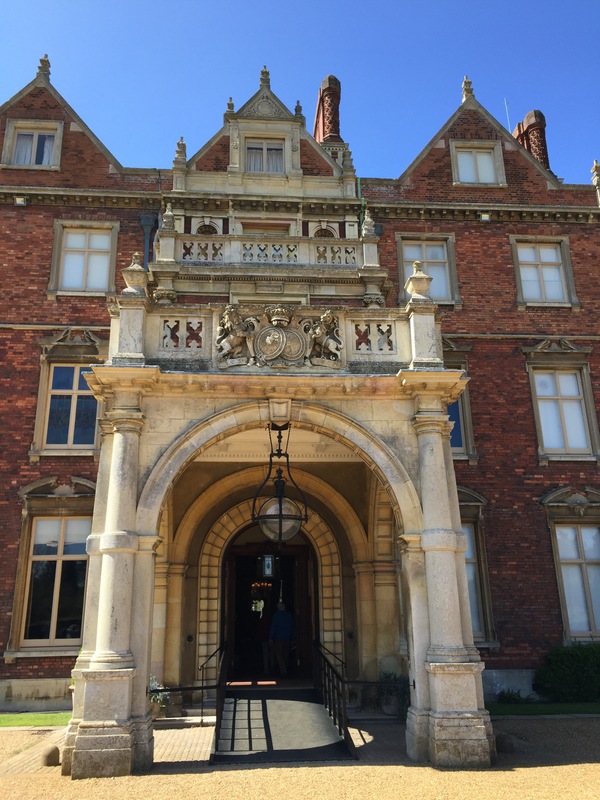 Photos are not allowed inside Sandringham House, but mere tourists like me are allowed to take pictures outside and in the nearby museum. This is the very grand entry, used by tourists and guests invited for grand occasions. I just learned that the Queen was recently in residence, possibly while I was there. But I’m sure there is a very private entrance for her and her personal guests. (I think there’s a separate ballroom entrance, which is an exit for tourists). Yesterday Prince William and his newly-expanded family left London for Anmer Hall, their newly-expanded mansion on the Sandringham estate. I thought I’d post a few photos from my recent visit there. 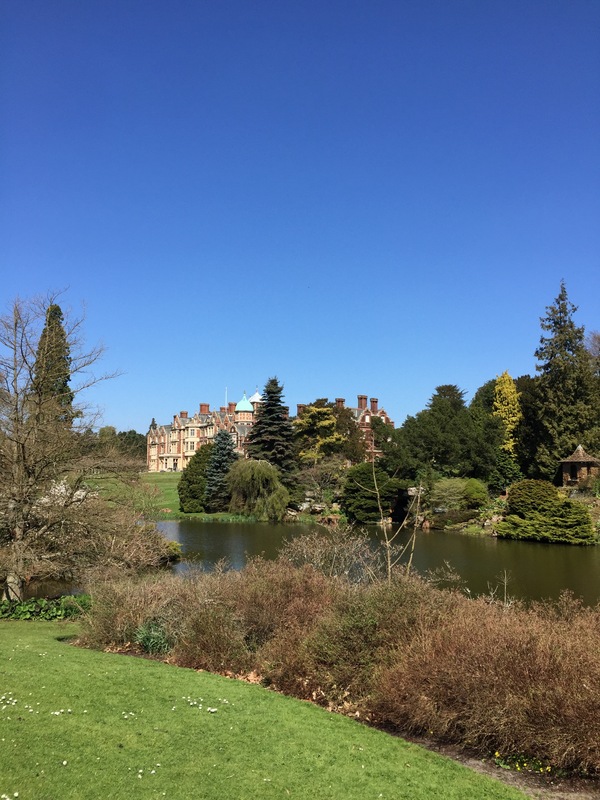 Sandringham is only open to tourists for a few months a year. At other times, it is the strictly private property of the Royal Family, bought during Victorian times as a retreat. The gardens have been open to the public since 1908. King George V created and opened the Museum in 1930, with an admission charge of 3 pence. In 1977, the present Queen Elizabeth decided to open some rooms of the house to tourists for a few months a year–very good PR, I think. The place certainly won me over. The museum, in the old stable block, is as interesting as the house. It contains, as the British would say, a lot of “bits and bobs” about the Royal Family. The family follows traditional pastimes at their country home. This old photo shows royal children looking very serious in 1905. 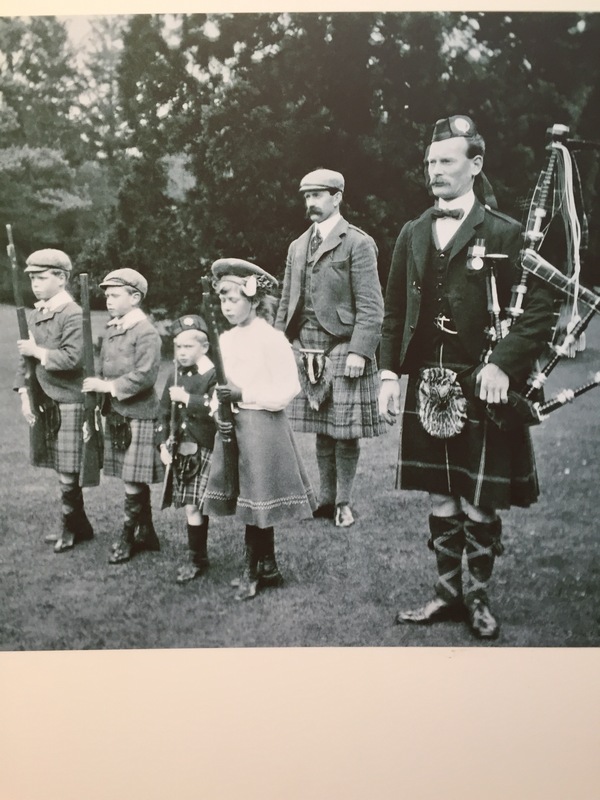 Princes Edward, Albert and Henry and Princess Mary are taking instruction in marching from the Piper, Forsyth. 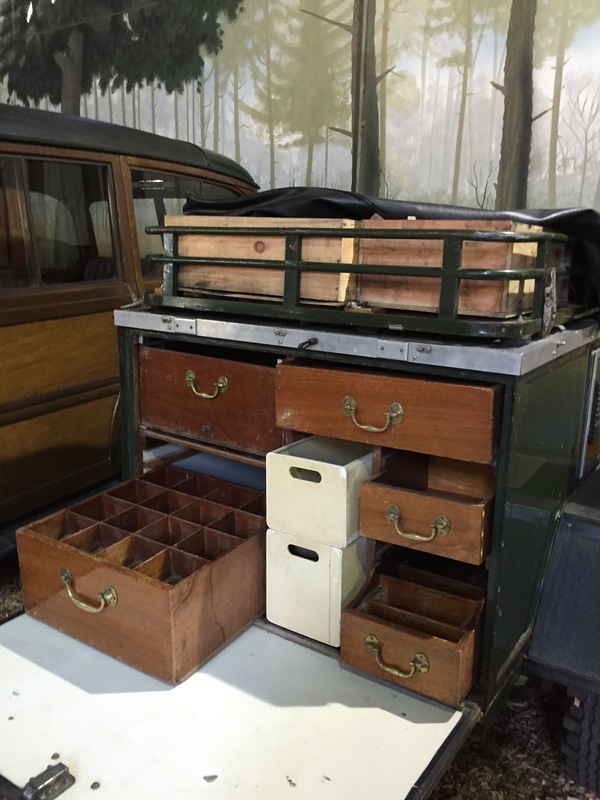 Among many fascinating retired vehicles, there’s a picnic wagon which was in use until fairly recently, when it was replaced with a new one. The picnic wagon has a place for everything, including wine bottles and fine china. 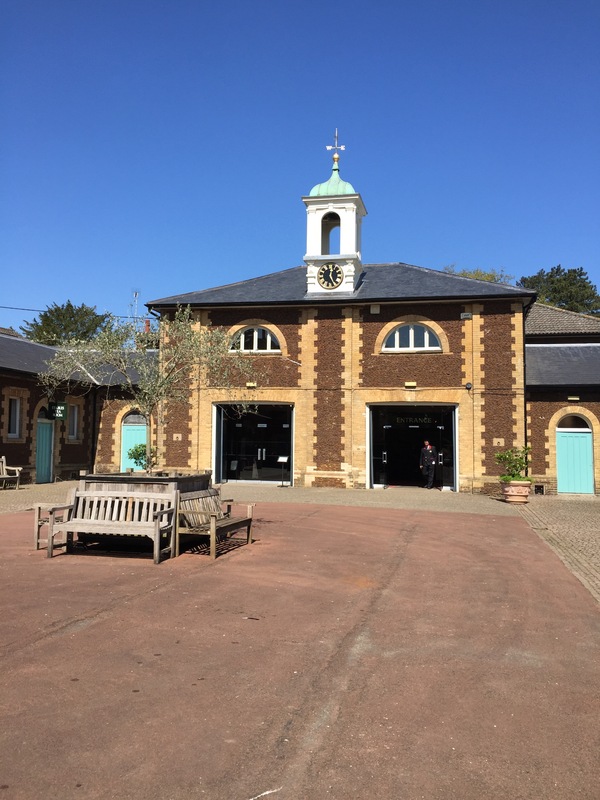 It’s housed in a large building with murals that show the Royal Family and their friends enjoying the great outdoors in their beautiful grounds. I’m sure family picnics will continue for the newest great-grandchildren of the Queen. Who knew that the Queen’s husband, Prince Philip, is a painter? He’s pretty good. 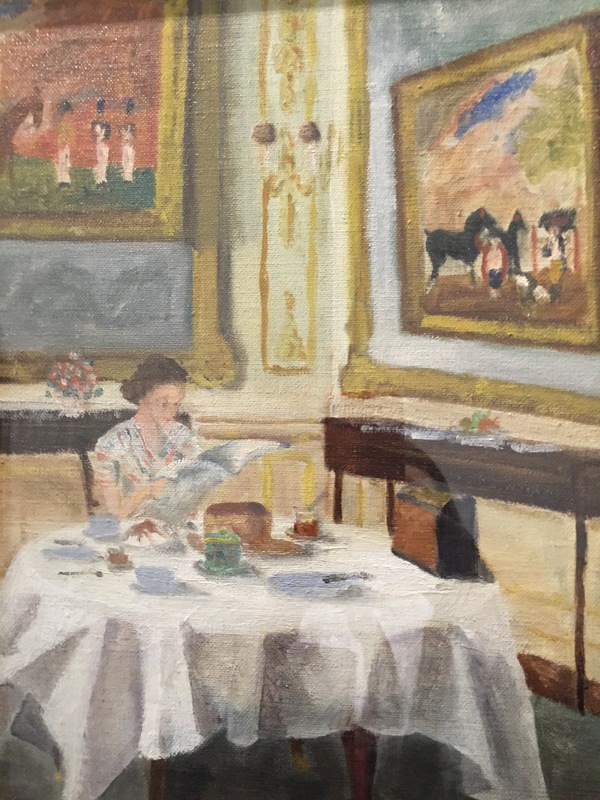 Who can resist this little informal portrait of the Queen reading the morning paper? The room guides in the house are the Queen’s regular trusted servants. They’re friendly and happy to chat. 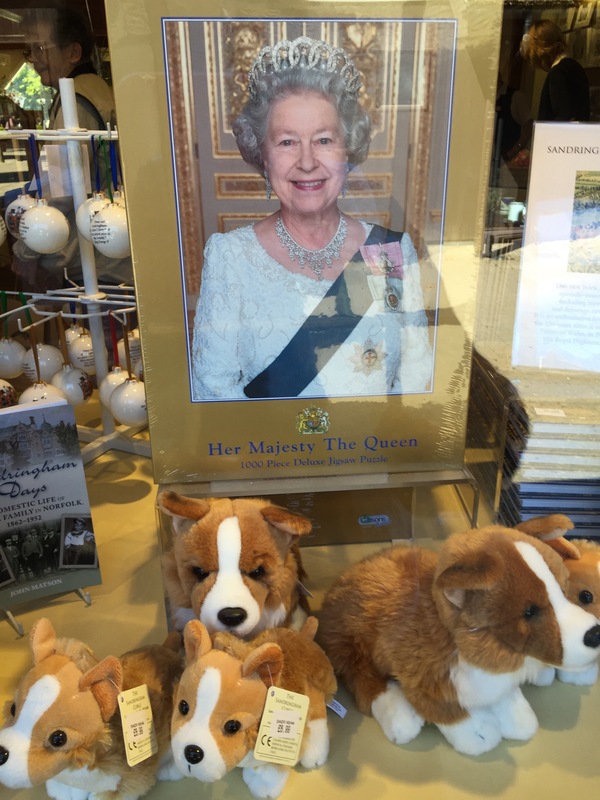 In the grand formal dining room, I asked whether the Corgis have the run of the house. Of course they do! The Queen feeds them personally in the Gun Room, and they mill around under the dining room table, probably cadging scraps like any other dogs. Right now there are seven Corgis. 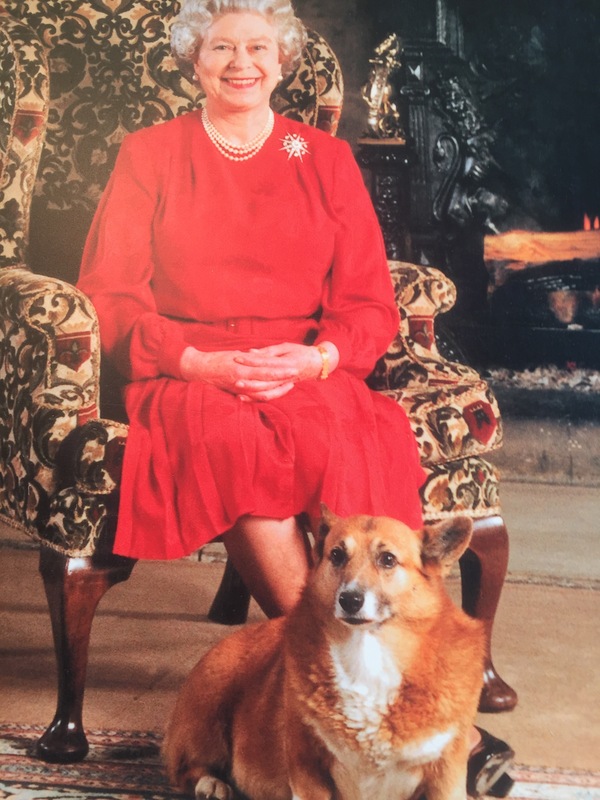 An elderly dog, the Queen’s beloved Monty, died recently. This year, Queen Elizabeth will become the longest-reigning British monarch in history. She has had to overcome her share of family troubles and occasional anti-monarchy sentiment. But as far as I can see, the Brits really love their Queen. And right now it seems most British folks also love the very appealing young family of William, Kate, George and Charlotte. The new little Princess Charlotte Elizabeth Diana of Cambridge will no doubt be delighted by the Queens’s Corgis. I’m sure the Queen will be a doting great-grandmother! This entry was posted in British Isles, Castles and Palaces, England, Historic Homes, Historical Figures and tagged Duchess Catherine, Duchess of Cambridge, King George V, Prince George of Cambridge, Prince Philip, Prince Philip as painter, Prince William, Princess Charlotte of Cambridge, Queen Elizabeth II, Queen's corgis, Sandringham House on May 7, 2015 by Claudia Suzan Carley. 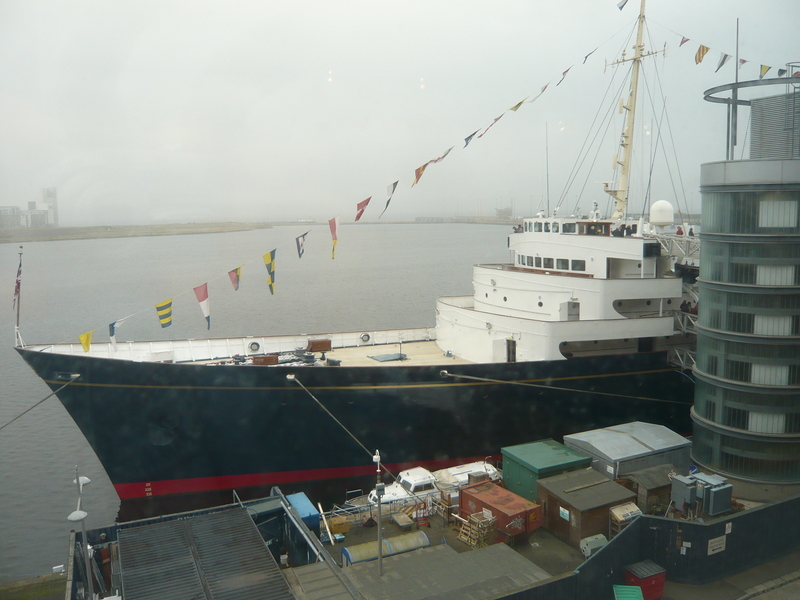 A short bus ride from central Edinburgh, the royal yacht “Britannia” is permanently moored and efficiently packaged as a prime tourist site. It’s one of the best ways for a mere commoner to ponder British royalty, past and present. 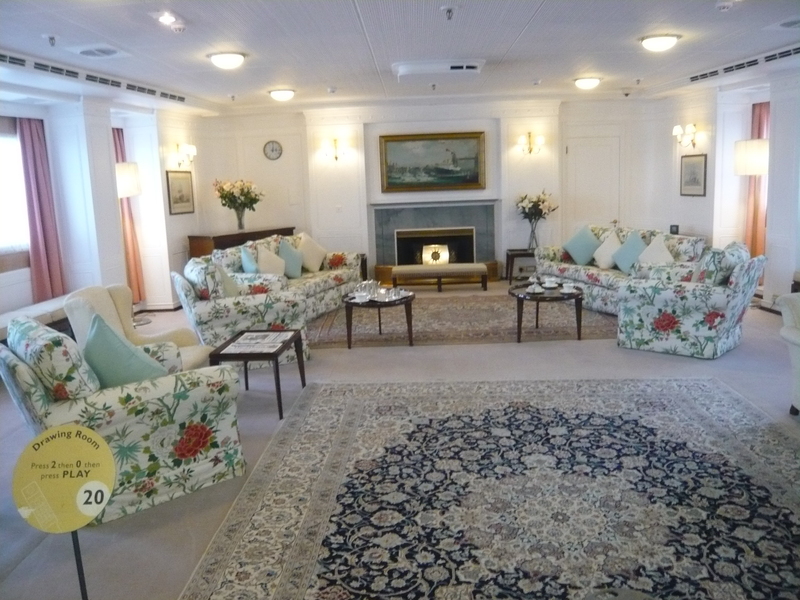 The ship was in active use between 1954 and 1997, when the expense of maintaining it was deemed too high and the Queen had to find other ways of sailing. In its heyday, the ship served as a floating official residence where the queen entertained heads of state. She could anchor her yacht anywhere on the globe and summon leaders to come to her. Hardly anyone turned down the invitation. The salon above was furnished in the height of stodgy royal elegance for its time. (In their inner sanctums, do royal Brits now go in for sleek HGTV-inspired square lines and neutral colors? I’ll have to wait for my invitation to a cozy afternoon tea with the Duchess of Cambridge to find out). 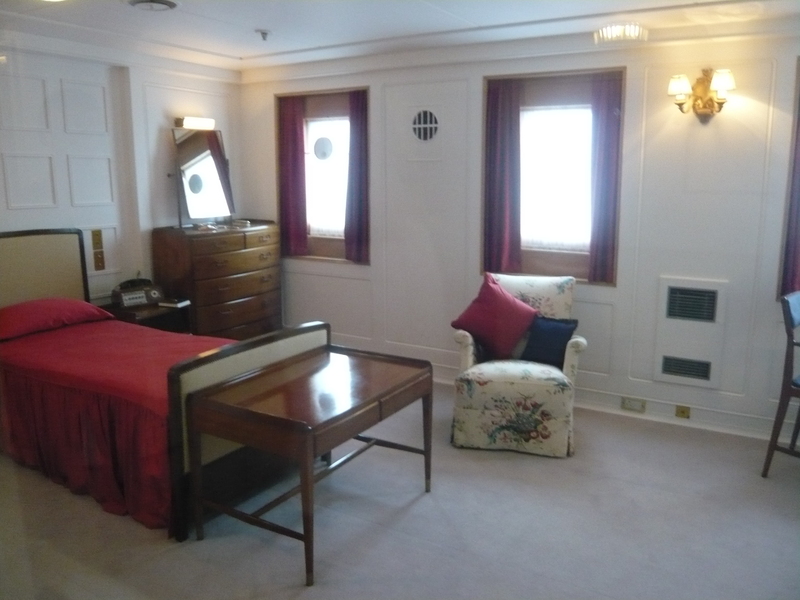 The Queen had her own stateroom, of course, with a handy bedside desk. Visitors can peer at her twin-size bed through a window, but nobody gets to bounce on Her Majesty’s bed. 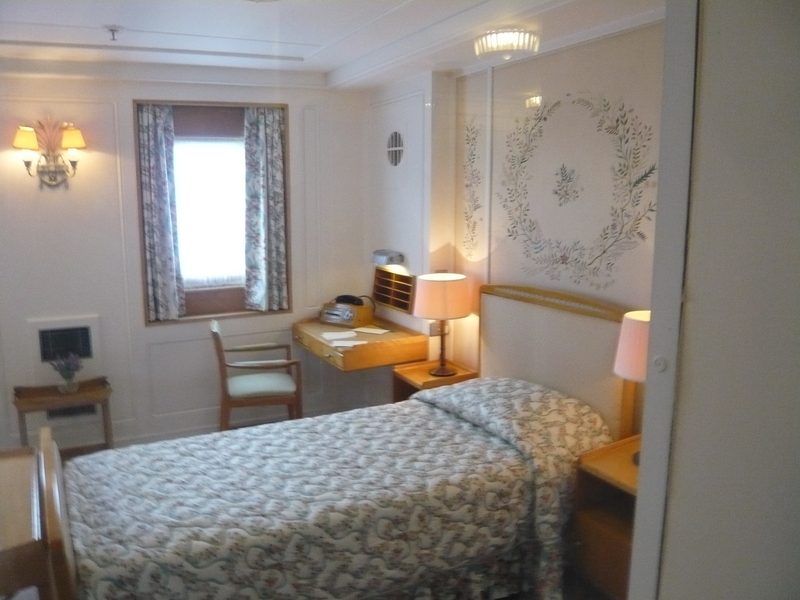 Prince Philip’s adjoining stateroom is more masculine, but less businesslike. I’ve read that when staying at various palaces, the Prince always demanded that the personal bathroom he was to use be freshly painted a particular shade of pink, even if it was usually painted blue. (Can’t remember the source). Onboard the “Britannia,” I think he had the exclusive use of a bathroom that no one else used, so there was never a need to pitch a fit about the color of the walls. 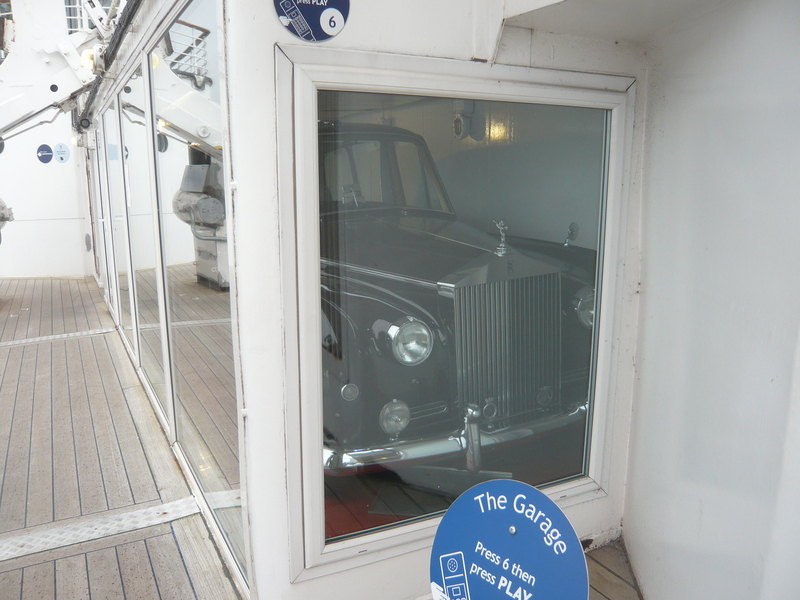 For onshore jaunts, a Rolls Royce was always at the ready. Who’s going to drive? Not the Queen. A crew of 21 officers and 250 yachtsman stood ready to serve the royal family’s every whim. There’s a lot to ponder on the Queen’s yacht. As an American, I always wonder how Brits put up with the lavish lifestyles of royalty. But then, how do we put up with the huge income disparities that seem to get wider every day in our own country? I’m sure that in the world of yachts, the Queen’s “Britannia” does not stack up as impressive, especially nowadays. But a visit gives a rare glimpse into royal life. Whenever they had the chance, the royals used set off on their boat and lived life on a smaller scale than they were used to in palaces. Clearly they enjoyed the close quarters and the more modest digs. Clambering around the boat as a tourist somehow makes the royals seem more like ordinary mortals. Maybe on the boat they enjoyed pretending they were more or less like the rest of us. This entry was posted in British Isles, England, Scotland and tagged Britannia royal yacht, Prince Philip, Queen Elizabeth II on February 19, 2015 by Claudia Suzan Carley. More than 237 years after the American Declaration of Independence, Great Britain is moving closer to a fully representative democracy. But considering that the British resolved to start working on the process over a hundred years ago, it might still take awhile. 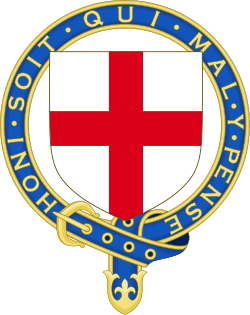 Since 1911, the British have made repeated stabs at reforming the House of Lords, which historically included only hereditary peers (plus high Church of England officials). In recent years, pressure has been building to just do it. Many would like to replace the ancient House of Lords with a fully-elected body, which would be similar to our Senate. Slowly but surely, change is coming. In 1066, William of Normandy crossed the English Channel and conquered England. He codified a feudal system in which a council of large landowners and church officials advised him. Titles were formalized, as in my previous post, More Peering at the Peerage. Having a title was a mixed blessing. At any time, the holder of the title could be summoned to the monarch’s court, at his own expense. He could be ordered to pay crippling taxes, or to raise an army. In compensation, he got to sit in council with the king, theoretically having some influence on decisions. (If I’d been sitting across the table from King Henry VIII, I’d have kept my head down). Eventually, the king’s council became the House of Lords, filled by nobles with hereditary titles and the lands that went with them. In 1215, under King John, the Magna Carta, or Great Charter of the Liberties of England, was written. Among other things, it stated that never again could the king tax without the consent of the governed–i.e., the nobles. (At this point, no one thought to worry much about commoners). Five hundred years later, the American colonists demanded the same rights for themselves. The Boston Tea Party was an audacious challenge to the English king’s practice of taxation without representation. Sometime in the 14th century, due to popular pressure, a House of Commons evolved in Britain so that commoners could have a say in government. The present 650 members are elected. They are called MPs, or Members of Parliament. They actually do the business of government. Since Great Britain is a constitutional monarchy, the monarch still has a formal role in government. The theory is that she (or he) provides continuity and stability. The same theory applies to the House of Lords, but its days could be numbered. To this day, though, the Queen presides over the opening of every new session of Parliament. I’ve often watched Question TIme in the House of Commons. Amid catcalls from one side and cries of “Hear, hear,” from the other, the British Prime Minister leaps up from his seat to answer the most provocative of questions. It’s a pretty good show. As far as I know, there is no such opportunity to watch the House of Lords at work. There are still 93 hereditary peers eligible to sit in the House of Lords. The remaining positions are filled by a complicated and ever-changing system of election and appointment which I can’t for the life of me understand. In fact, I can’t even figure out how many people are entitled to wear the heavy red velvet robes of the House of Lords. Should the British eliminate the peerage? One reason it has not yet happened is that the British people love their traditions. Cynics argue that the hereditary peerage (and the monarchy) provide nifty spectacles for tourists. I can’t argue with that. Join me next time for more explorations in the art and history of Europe and the British Isles. This entry was posted in British Isles, England, Uncategorized and tagged 1066, American Declaration of Independence, Boston Tea Party, British House of COmmons, British House of Lords, British Peerage, Great Charter of the Liberties of England, hereditary peers, King John, Magna Carta, Prince Philip, Queen Elizabeth II, reform of House of Lords, taxation without representation, the Norman Conquest, William the Conqueror on July 9, 2013 by Claudia Suzan Carley.